A: Massage is a term describing a variety of techniques using the hands, mechanical or electrical apparatus to stimulate or soothe soft tissues of the body for therapeutic purposes. Q: How does Massage work? A: Massage works by kneading and stroking muscles to relax them, and uses friction to stimulate soft tissues. This therapy can increase blood and lymph circulation while breaking up scar tissue between muscle fibers. 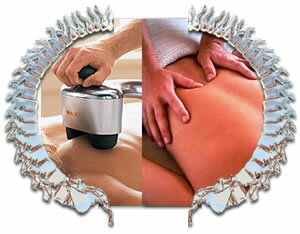 In our office we utilize mechanical massage but also incorporate massage by hand when applicable. Q: Why is Massage used in our office? A: Massage is useful in many conditions in which body relaxation, the reduction of swelling, and muscle mobilization is desired. Massage can be helpful in overcoming the swelling and pooling of fluids at the site of recent injury or trauma.